I set myself a brief to design a t-shirt that might be worn by the character Sheldon Cooper from The Big Bang Theory. 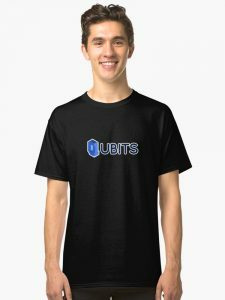 I settled on Quantum Computing as the subject, specifically the quantum bit, or qubit. In traditional computing a bit is the smallest piece of information you can store, and each bit represents either a 1 or a 0. A qubit, given the spooky powers of quantum physics exists as both 1 and 0 at the same time. The design I came up with forms the letter Q as a 3 dimensional object composed of pixels. From one side it would look like a 0 and from the other, a 1. T-shirts and mugs now for sale on Redbubble and Society6.